Paper slows down business. That’s why most companies we surveyed are already moving from paper to digital. They want to reduce costs, improve productivity, and make it easier to share documents. But where they’re at in their transformational journey varies by industry, business function and country. Check out results for your industry, and think about how your own organization compares. How could going deeper with digitization transform the way you communicate, connect and work? How far along is your industry with digitization? 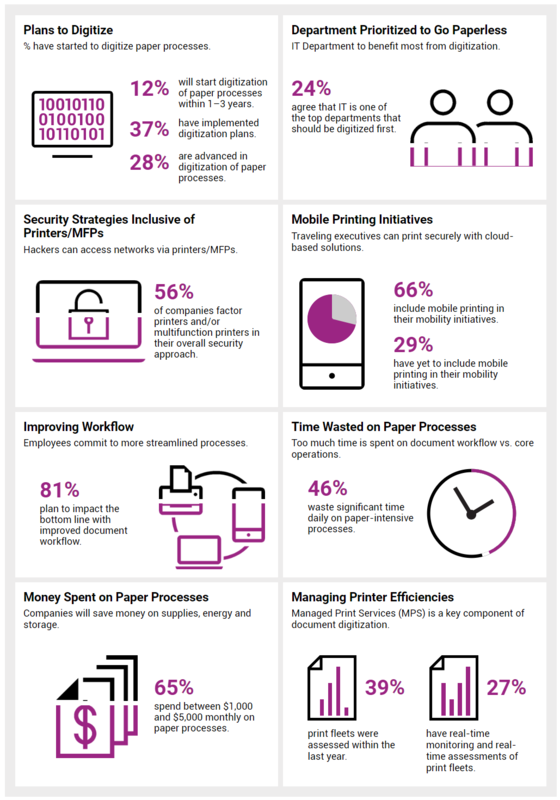 Around 65% of businesses are already starting to digitize paper processes. Their goal? To improve workflows, productivity, and performance. How does your organization stack up? 1,021 companies in the US, UK, Germany, and France were surveyed. Survey conducted by Coleman Parkes and commissioned by Xerox. 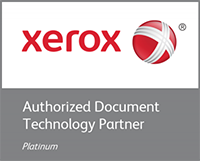 Just over half of companies are using printers/MFPs as part of their security approach to help protect against malicious attacks and unauthorized access to documents and stored information. 46% of companies waste significant time daily on paper processes, which can be time used to grow the business. Across all small and mid-size businesses, only 27% of companies undergo real-time assessments to ensure better document management.